Next weekend, I’m proud to be a participant at TusCon 45 being held at the Sheraton Tucson Hotel and Suites in Tucson, Arizona. The guest of honor is Joe R. Lansdale, the author of more than forty novels and numerous short stories, including Paradise Sky, the Edgar Award-winning The Bottoms, Sunset and Sawdust, and Leather Maiden. This year’s toastmaster is Weston Ochse. TusCon is a small convention but one that attracts dedicated and enthusiastic fans of all ages who share a love of the written word. 4:00-5:00pm – Panel Room 2 (Mesa) – Letting your personal secrets out in your stories. Alcoholic writers with alcoholic characters. Gay writers with gay characters. Abused writers with abused characters. How much of yourself should be in your story. On the panel with me are Joe R. Lansdale, Eric T. Knight, Gemma Lauren Krebs, and Gloria McMillan. 7:00-9:00PM – Ballroom (Sabino) – Meet the Guests. Come rub elbows with the guests, enjoy the cash bar, and be regaled by Toastmaster Weston Ochse. 10:00-11:00pm – Ballroom (Sabino) – Drake & McTrowell’s Hot Potato School of Writing. The authors of “The Adventures of Drake & McTrowell” will lead two guest authors and the audience in a madcap improvisational writing game show reminiscent of their signature “Hot Potato” team writing style. Two audience volunteers will each team up with two guest authors to form two “writing teams.” The audience will select three plot elements from a list provided by Drake & McTrowell. The two teams will take turns “writing” the beginning, middle, and end of a story incorporating all three elements with two audience-created “Hot Potatoes” thrown in for excitement. Erasmus Drake and Sparky McTrowell host the show. Ross Lampert and I will be the guest authors. 11:00am-noon – Ballroom (Sabino) – Have We Lost the Spirit of Exploration? NASA is a joke, deep sea exploration is dead, and nobody is listening to SETI. What happened to our frontiers? On the panel with me are Bob Nelson, Hal C.F. Astell, Wolf Forrest, Ross Lampert, and Joe Palmer. 1:00-2:00pm – Catalina Ballroom Foyer – Autographs. I’ll be signing autographs alongside such luminaries are Ken St. Andre, Jennifer Roberson and Frankie Robertson. 6:30-9:00pm – Ballroom (Sabino) – Revenge of Zoe. Premier of the film Revenge of Zoe, starring Bradford Trojan, Nathan Campbell, Eric Schumacher, and Rachel Netherton as Zoe/Fren-Zee. In the film, screenwriter Billy Shaw must face his inner demons while convincing comic book store owners John and Pete to help him write a sequel to his greatest work; a movie about comic book super heroine Fren-Zee. Filmed in, and around, Tucson. Hosted by actor/producer Geoff Notkin, followed by Q&A with cast & crew from the film. I play one of the customers in the shop and I’m looking forward to my motion picture debut. Noon-1:00pm – Ballroom (Sabino) – Great Art Comes From Limitations. How what you can’t do influences your art. On the panel with me are Diana Terrill Clark, William Herr, Julie Verley, and Curt Booth. In addition to all these great programming options, Hadrosaur Productions will have a table in the dealer’s room. Come by and see what great books we have to offer. Also, Hadrosaur Productions along with Massoglia Books will be sponsoring the annual birthday party for Marty Massoglia and myself on Saturday night. Drop by our booths in the dealer’s room to learn to learn the time and location of the party! This weekend, I’m having fun at Wild Wild West Con at Old Tucson Studios in Tucson, Arizona. If you’re in town, I hope you’ll drop by and join the fun. You can find more information at: https://www.wildwestcon.com/. Next weekend is the Tucson Festival of Books at the University of Arizona. It’s a free event running from March 10-11. There are vendors and exhibits spread across the University of Arizona mall. There are also presentations about the craft of writing by many of the top writers working today in the lecture halls near the mall. Among the featured writers are Amy Tan, Dave Berry, J.A. Jance, and Douglas Preston. I’ll be involved in two presentations at the festival. Saturday, March 10 – 10am to 11am – Scientists Who Write Science Fiction – Integrated Learning Center Room 141. Jim Doty and I, who are both real-live practicing scientists who use our knowledge to write science fiction, will talk about our process. Saturday, March 10 – 4pm-5pm – Magical History – Student Union Santa Rita. I’ll be moderating this panel in which Gail Carriger, Beth Cato and Mindy Tarquini, authors of novels filled with magic and mystery will discuss alternative earth histories where magic, the paranormal or time travel are real. In both cases, I’ll have my books along and can sell and sign them after each of the events. One thing that’s especially exciting about the Magical History panel, is that Beth Cato is a long-time contributor to Tales of the Talisman magazine, so I’ve long followed her work. As it turns out, I also know Gail Carriger after we did several panels together at Gaslight Gathering in San Diego. Here we are on one of the panels at Gaslight Gathering. One of the big events the festival is touting is a concert by the group called The Rock Bottom Remainders. They’ll perform on March 10, immediately following the festival’s close. This is a band formed by several bestselling authors. Those members at the festival are Mitch Albom, Dave Barry, Gary Iles, Mary Karr, Ridley Pearson, Amy Tan, and Scott Turow. The outdoor concert will be at Jefferson Field. There will be food trucks, a cash bar, and plenty of space to dance! It’s time once again for Wild Wild West Con, which has grown into one of the largest, regular steampunk conventions in the United States. I will be there giving presentations, running a workshop, and on panels. I will be vending in the Stage 2 Dealer’s Area with the ever fabulous Chief Inspector Erasmus Drake and Dr. Sparky McTrowell. This year’s Saturday night concert features DEVM and Abney Park. There will be tea dueling, make and take workshops, fun activities for kids, plus all the regular attractions of Old Tucson Studios. Old Tucson is the place where many famous western films were made including Rio Bravo, Gunfight at the O.K. Corral, and Tombstone. It’s fabulous to see these famous western sets occupied by people in steampunk attire. It always gives me another year of steampunk inspiration. 2pm – Steampunk Authors – Panel Tent. The authors of Wild Wild West Con will gather to discuss their experiences, the state of the genre, and how you can succeed as a Steampunk author. Diesel Jester and I will be there for sure. We’ll see who else we can round up to share the stage with us! 11am – Robots are from Mars. Dinosaurs are from Venus – Courtroom Center. This presentation is a look at the astronomy of the Victorian era, what people thought life on alien planets was like, and how it influenced the science fiction of the day, and perhaps introduce you to some authors you’ve never heard of before! 2pm – Meet and Greet – Aristocrat Lounge. Diesel Jester and I are scheduled for an author meet and greet, open to those folks who purchased Aristocrat tickets to the convention. It’s a great chance to sit down, have a cool drink, and ask us questions. Who knows? Maybe you can persuade us to read something to you! 12pm – Dinosaurs and Robots in Verse – Chapel. I will be leading a poetry workshop. I have a few exercises and fun prompts that will let you create your own poems about steampunk robots, dinosaurs and more. Also, I will note that poems created at these workshops have gone on to achieve publication. Also at the convention this year will be Hadrosaur Productions author David B. Riley who will be presenting several panels. His book Legends of the Dragon Cowboys will be available at our table. I’ve been working days this past week at the Mayall 4-meter telescope at Kitt Peak. 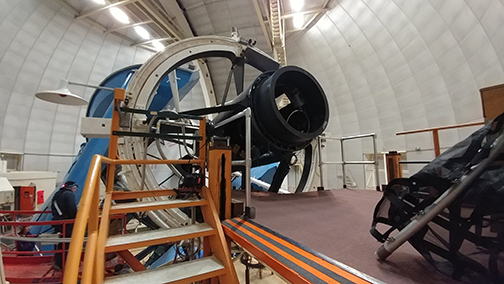 The telescope is undergoing a roughly year-long refit to equip it with a 5000-fiber spectrograph which will be used to obtain optical spectra for tens of millions of galaxies and quasars, constructing a three-dimensional map spanning the nearby universe to 10 billion light years. This week, much of our work has been disassembling the telescope to prep it for new parts coming this year. In the photo below, you see the top end of the telescope with all the optics removed. That entire top end will be removed and replaced with the fiber optics which will then direct light to spectrographs some four floors below. This past week was also a short work week. For most people in the United States that was because Monday, February 19 was President’s Day. Even though Kitt Peak is a federal contractor, we actually don’t take President’s Day as a holiday. Instead, we get Rodeo Day the Friday after President’s Day. Before I continue, allow me to make a brief aside. I’ve mentioned before that at Kitt Peak, we work through most holidays. I should clarify that we are on sky, observing almost every night of the year. Telescope support staff such as telescope operators, electronic maintenance technicians, and even kitchen staff only take off Christmas Eve and Christmas. However, Kitt Peak also maintains a large support staff of mechanics, electricians, carpenters, and heavy equipment operators, most of which get weekends and regular holidays off. The refit work at the Mayall mostly requires this larger team of employees, so it follows a more familiar weekday schedule. So, where did Rodeo Day come from and why is it so important in Tucson? Apparently, it started in 1925 when the president of the Arizona Polo Association, a fellow named Leighton Kramer, paraded a group of trick riders, folk dancers, and marching bands through downtown Tucson to the University of Arizona’s polo field where they held a community sponsored Wild West show and rodeo. That first rodeo featured steer wrestling, steer tying, calf roping, and saddle bronc riding. The rodeo’s official name is La Fiesta de los Vaqueros. Over the years the event grew and it became tradition for Tucson schools to give kids the Thursday and Friday of rodeo weekend off. I think it goes to show the importance of rodeo in the Southwestern United States that it can supplant even President’s Day in some communities. The Spanish name for the Tucson Rodeo, La Fiesta de los Vaqueros, reminds us that rodeo’s popularity isn’t limited to the Southwestern United States. It’s actually quite popular throughout central and South America. When I visited Chile in 1998, the driver for Cerro Tololo Interamerican Observatory made a point of taking me by the rodeo grounds in La Serena. He noted that it was perhaps the second most popular sport in La Serena, right behind Soccer. I’ll also note that CTIO is actually a United States Observatory in Chile and the Blanco 4-meter outside of La Serena is, for all intents and purposes a twin of the Mayall 4-meter on Kitt Peak. As it turns out, this whole business of rodeo being important to the people I work with in the astronomy business is one of the influences on my story “Calamari Rodeo” which appears in the anthology Kepler’s Cowboys. You can learn more about the anthology at http://www.davidleesummers.com/Keplers-Cowboys.html. 12pm-1pm – Autographing – Canyon Theater Foyer. I’ll be signing autographs alongside Jeffrey J. Mariotte, Marsheilla Rockwell, Rick Cook, and Dr. David Williams. 2pm-3pm – The Astronomer’s Crypt: Making a Book and a Trailer – Panel Room 2 (Pima B). Filmmaker Eric Schumacher and I will debut our short film which presents a scene from my novel, The Astronomer’s Crypt. Our goal with this project is to make something that goes beyond the ordinary book trailer and actually brings you inside the world of the book. We’ll discuss how we made the trailer and, if you’re an author, we’ll show you how we can help you get more eyes on your book. 4pm-5pm – Publishing in 2017 – The Options, the Opportunities, the Pitfalls – Ballroom (Sabino). There’s the big press, the small press, the self press, the no press. What to do what to do? On the panel with me are Ron Collins, Julie Verley, Cynthia Ward, Beth Meacham, and Catherine Wells. 5pm-6pm – The Snowball Effect: How to pick up steam on the way to making a low-budget film – Panel Room 1 (Pima A). I’ll join director Marty Ketola, actor Eric Schumacher, and actor Geoff Notkin to discuss the making of the indie film Revenge of Zoe in which screenwriter Billy Shaw must face his inner demons while convincing comic book store owners John and Pete to help him write a sequel to his greatest work; a movie about comic book super heroine Fren-Zee. 7pm-8pm – Why Do Adults Like Young Adult Fiction? – Ballroom (Sabino). What are adults finding in the “kids” shelves that they’re not find in the rest of the bookstore? On the panel with me are Linda Addison, Mary Fan, Jim Doty, Jill Knowles, and Beth Meacham. Also, I’m planning my annual shared birthday celebration with fellow longtime TusCon dealer Marty Massoglia on Saturday night after all the panels. Check with us at the convention for details. We might even go back in time on Friday night to TusCon 43 to have the party we missed last year! Tucson and Las Cruces this weekend! This coming weekend I’ll be signing books in both Tucson, Arizona and Las Cruces, New Mexico. Details about both events are below. Among the authors on hand will be Jessica Feinberg, Natalie Wright, and Natasha Cover. There will be many other authors as well. From past experience, it pays to arrive early to the event so you can have time to browse all the authors’ work. Also, don’t stop with the authors at the front of the store, Bookmans often places authors throughout the building. If you come to have books signed and don’t see me at the front of the store, please come looking! The Celebrate Authors Event publicly celebrates the talent, hard work, and achievements of southern New Mexican authors. Booktalks, displays, and book signings by authors will promote the diversity and excellence of literary talent throughout our community. Refreshments will be provided as well. There will be twenty-four authors attending, including Stan Blitz, Win Jacobs, Deanna Dickenson McCall, and Michelle Wing. I attended this event last year and it was a great chance to meet authors from Las Cruces who work in many different genres and learn about their work.